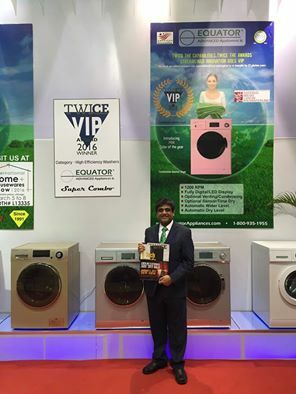 Equator Advanced Appliances and its 2016 TWICE VIP Award! Congratulations to Equator Advanced Appliances and its 2016 TWICE VIP Award! Here the company is showing it off at this month's Canton Fair in Guangzhou, China. HOUSTON - Global appliance leader Equator Advanced Appliances will debut a major home laundry innovation at the CES & KBIS Conventions in January 2016: a “Smart” combo washer-dryer with Wi-Fi capabilities. HOUSTON - Global appliance leader Equator Advanced Appliances will debut another new home laundry innovation this month. Equator’s newest Standard 860-110V Compact Dryer makes its reappearance in white. HOUSTON—Global appliance leader Equator Advanced Appliances will debut a new, compact home innovation this month. The stainless, 7-bottle wine refrigerator will delight wine aficionados worldwide and take the small-home appliance market to the next level of high-tech efficiency. With Equator’s signature flair for staying years ahead of its time in compact designs, the appliance leader continues exhibiting its commitment to technological progress. HOUSTON-Global appliance leader Equator Advanced Appliances will debut another new home laundry innovation this month. Equator’s newest offering, the white Super Combo EZ 4400 CV, is economically and environmentally-friendly, and provides a fourth color option for style-savvy users to choose from. HOUSTON - Global appliance leader Equator Advanced Appliances will debut another of its innovative products this month: The new stainless, CMO 800 Combo Microwave-Oven is a compact appliance that provides cooking convenience with a mini-footprint. Atul Vir, the President of Equator Appliances, spent some time answering our questions for a recent episode of Corner Office. In an industry dominated by multinational giants, it’s not easy for a smaller player to compete, let alone for over two decades.